Affiliate programs are commonly setup as pay for performance programs which allows the merchant to control their marketing costs as promotional costs only occur when sales are controllable actions occur. Affiliate programs can produce higher advertising revenue for promotional partners as the affiliate commission can be much higher than advertising revenue that is received from other types of advertising (such as banner ads). The typical ad revenue for banner and other ads is approximately $10 to $20 per thousand unique visitors. The revenue from affiliate links may generate over $100 per thousand visitors. For affiliate marketing to work, a company that has a marketing interest that is similar to another company’s contacts them to propose a shared marketing relationship. 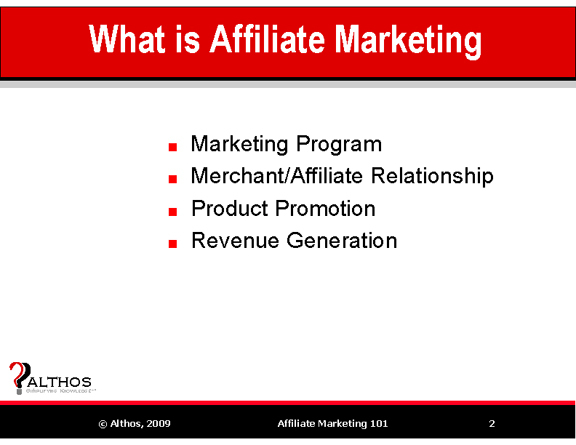 The affiliate partner (also called a publisher) may promote the products or services on their web site, by sending email messages, using search engine marketing programs or other forms of communication to potential customers. The affiliate merchant provides the affiliate partner with content (such as product images and descriptions) to use in their promotional programs. After the terms of the affiliate relationship are negotiated, an affiliate marketing link account is created and hyperlinks with account codes are provided to the affiliate partner. An additional link and login account may be created to provide the company or person with a link that can be used to track the referred sales activity of the affiliate partner. This book explains how to setup and manage Internet affiliate marketing programs. You will discover what affiliate marketing programs can do for companies and how the business objectives for affiliate marketing programs go far beyond the increase in sales.